This hardware‑based room correction system includes an audio interface and monitor controller. Is it the answer to your acoustics nightmares, or just too good to be true? Wouldn't life be so much easier if we could simply plug in a little black box to do all the work? Thankfully, KRK haven't fallen into this simplistic trap with their new Ergo (Enhanced Room Geometry Optimization) system. 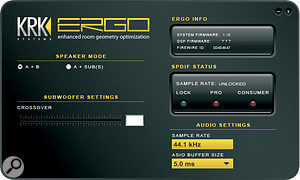 The Ergo is certainly a little black box, but it's one that contains a surprising array of features: a 4‑in/6‑out Firewire audio interface, a simple monitor controller with integral headphone amp, and a sophisticated 'RoomPerfect' DSP room correction system, licensed from Lyngdorf Audio (formerly TacT, of Millennium digital-amplifier fame). Most importantly, KRK make no claims that Ergo will replace traditional acoustic treatment: they consider such treatment to be a great start towards a perfect room, with Ergo taking you even closer. So, with this in mind, let's see how close it can get you. I was expecting the Ergo to be larger, but at 180mm wide, 107mm from top to bottom, and 107mm tall, it actually has a desktop footprint slightly smaller than a DVD case. However, the design and ergonomics of this little box are impressive, with a tough, 2mm‑thick folded metal case featuring a smoothly sloping front-panel and attractively sculpted side panels. The sockets are on the rear panel so that all cables emerge in the same direction, helping to keep them neat and tidy, and a non‑slip rubber base plate keeps the Ergo stable. The monitor controller features comprise a large and extremely smoothly operating Volume knob with 'KRK yellow' illuminated pointer and outer ring, plus three illuminated front‑panel buttons. 'A' and 'B/Sub' can either switch between two separate pairs of loudspeakers in 'A+B' mode or, in 'A+Sub' mode, provide separate control over a subwoofer for those using 2.1 systems. In the latter mode, the control-panel utility provides a crossover‑frequency control setting between 40Hz and 200Hz. The third button, 'Focus/Global', is intriguing. In Global mode, Ergo's DSP power is devoted to fixing frequency‑domain problems across a large area of the room: ideal when there's a group of people who want to listen. With Focus mode, the DSP power is instead concentrated on the mixing 'sweet spot' alone, apparently dealing with frequency and, to some extent, time‑domain issues, for the best results at the listening position (but possibly to the detriment of the sound in other parts of the room). 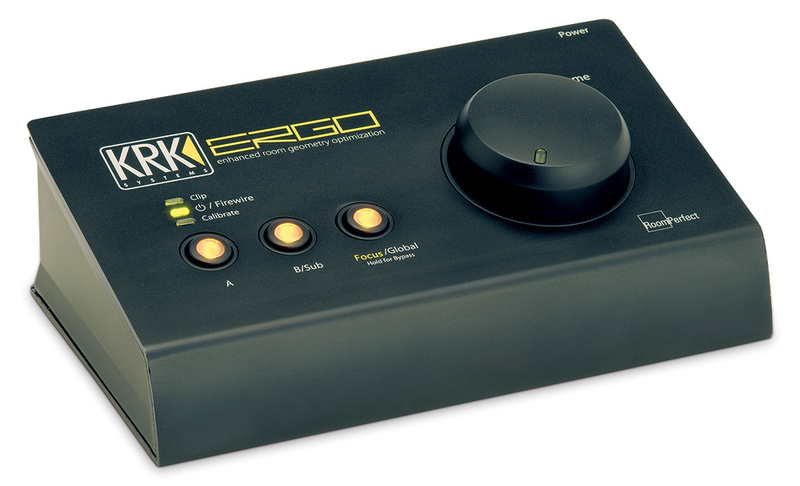 As well as being a sophisticated room correction system and monitor controller, the Ergo is also a 4‑in/6‑out Firewire audio interface with its own Control Panel utility.If you hold this button down for a couple of seconds, the system drops into Bypass mode, so you can hear the unaltered signal, which can also be heard at all times via the headphone amp. Although I wasn't too keen to find the thumbwheel level‑control for the headphones hidden away on the right‑hand side of the case, rather than on the top panel, this does place it neatly under your fingertips when you're adjusting the main level control. The front panel is completed by three status-LEDs that indicate power/Firewire connection, Calibrate mode (more on this later), and analogue clipping for the supplied mic during calibration mode and the line‑level inputs during normal use. Because of its diminutive stature, all of the Ergo's rear‑panel analogue I/O is on quarter‑inch TRS‑wired jacks: one for the calibration mic input, two for the line‑level inputs, four for the A/B outputs, and a final one for headphone output. There's also an S/PDIF input, plus two Firewire ports for connecting the Ergo to your computer and chaining other devices. You can power the Ergo from your computer using these six‑pin Firewire connections, but a 12V DC power supply is also supplied. Completing the package is an omnidirectional measurement mic, a short XLR to TRS jack adaptor and a mic‑stand clip. KRK don't recommend using other mics, especially since Ergo's dedicated Cal Mic input supplies non‑standard 15V phantom power — but then, as the mic is supplied, there's no need to do so. Software drivers are available for Windows XP, Vista 32‑bit, and Mac OS 10.5 or later. As I wrote this review, KRK were working with Apple to resolve problems running the Ergo as an audio interface, but I experienced no problems running under Windows XP. 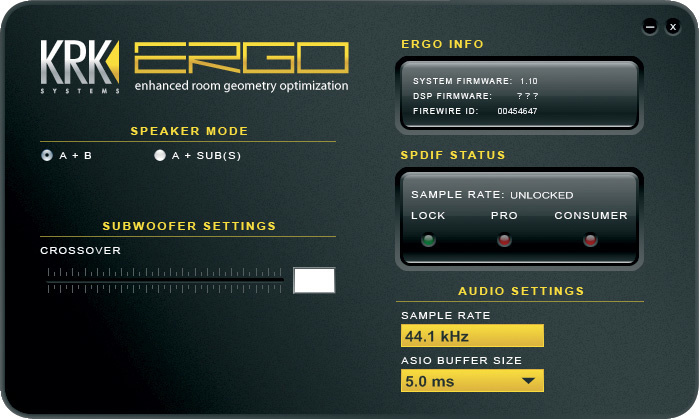 In essence, Ergo's room correction is a 1024‑tap FIR (Finite Impulse Response) filter that, by default, operates at a sample rate of 96kHz, running in a 400MHz Blackfin DSP chip inside the Ergo case. To get the filters calibrated to compensate for your room deficiencies, you need to run the supplied Ergo Cal software — and I found its step‑by‑step approach very straightforward. You first place the supplied mic at your main 'Focus' listening position, adjust loudspeaker levels as requested, and allow the left and then right calibration signals to be recorded via the mic. KRK recommend taking at least three further such measurements with different mic positions separated by at least a metre, and stress that you should incorporate higher and lower mic positions, so that the Ergo's 3D acoustic model can gather as much room information as possible. As each calculation is completed you get a read-out of 'RoomKnowledge', and once this reaches 90 percent or greater you're done. Across several runs, I found I always got an initial RoomKnowledge figure of 55 percent, and only needed three further measurements before it rose to around 95 percent. The whole process took less than 10 minutes and was essentially foolproof (although I got some worrying low‑frequency feedback every time Ergo was busy calculating its filter responses). Another advantage of the Ergo is that it means that you can place your loudspeakers closer to walls, since the filter can correct for the increased bass end, while the end result may sound better because the reflection from this wall will arrive at your ears more time‑aligned to the direct signal, resulting in better transients. A look at the rear panel reveals a range of analogue I/O on jack sockets, including a stereo analogue input, an input for the calibration microphone and two stereo analogue outputs for your speakers, as well as a headphone socket, two Firewire ports and a S/PDIF input. In my small studio I have ATC SCM10 Pro monitors, a Lavry DA10 D/A converter, six Realtraps Minitraps, three DIY 'Megatraps', plus various four‑inch thick Melatech acoustic tiles. Overall, I'm pleased with its acoustics at the listening position, although I'm aware that elsewhere the room is less balanced. Despite initial reservations, I certainly heard various subtle improvements at the listening position with the Ergo in circuit, with a tighter bass end and more open mid‑range. The most significant improvement, though, was to the stereo imaging, and with hindsight I can understand why. Like so many studios, mine isn't perfectly symmetrical, because there's a large window on one side that results in slightly different frequency responses from each loudspeaker. The Ergo compensated for this, matching the sound of each loudspeaker more closely. Switching from Global to Focus mode further tightened the stereo imaging, presumably by further balancing the two loudspeaker responses at the listening position, at the expense of compromised sound elsewhere in the room. I experienced more radical improvements with my sitting‑room hi‑fi system (where there's no acoustic treatment), so I suspect that the Ergo could prove very handy where domestic considerations prevent regular bass trapping, as well as on location recording sessions, where you need to hear reasonably balanced playback in unfamiliar territory. As an audio interface, the Ergo also fared quite well, with a measured 0.002 percent THD that was better than the specified 0.003 percent, and although I couldn't duplicate its claimed 118dBA dynamic range (instead measuring a modest 98dBA at 44.1kHz) it was nevertheless quiet and clean. Inside Cubase 4.5.1 I could run its ASIO drivers right down to the 1ms buffer size at 44.1kHz, although the Centrance ASIO Latency Test utility measured the input/output round trip at 8.7ms, presumably due to the extra on‑board buffers found on almost all Firewire audio interfaces. The necessary measurement mic is supplied as part of the Ergo package. Overall I was impressed by KRK's Ergo, but £450$600 buys you a lot of traditional acoustic treatment, and however clever it is, no black box can eradicate room modal ringing and nulls. What you really want to know is whether the Ergo will make your own room sound better — and whether it's worth the money. The answer to the first question will, in most cases be yes, but the second is more tricky to answer, since the results will vary from room to room (even KRK acknowledge that "Ergo's effects may vary from subtle to extreme”), so an audition in your studio would, therefore, be wise. If you've no acoustic treatment installed, the Ergo may result in significant improvements, but probably still not sufficient alone to enable your mixes to 'travel' well. Spending the same amount on bass traps and acoustic tiles will almost certainly result in better acoustics, with reduced modal ringing and nulls. If you already have acoustic treatment, the Ergo could be the icing on the cake. However, I suspect that the perfect customer for the Ergo is the musician who has a studio with some acoustic treatment and is already looking for a stereo Firewire audio interface and monitor controller. Its built‑in room correction features then become a big advantage. Viewed in this light, the Ergo is excellent value for money. There are some sophisticated products for the home theatre and hi‑fi markets, including Lyngdorf's RoomPerfect and the Audyssey MultEQ. The Ergo's main competitor, though, is IK Multimedia's ARC. Although based on similar technology, it differs from the Ergo in a number of ways: the Ergo uses dedicated DSP, whereas ARC is software; the Ergo operates from 20Hz to 500Hz, while ARC offers full‑range correction (the worst problems are usually below 300Hz, and above this you can generally deal with them fairly easily with acoustic foam tiles); both use multiple points in the room to build a more realistic picture of the acoustics, but the Ergo's Focus and Global modes are more versatile; and the Ergo takes account of height information to further refine the corrected response, while ARC does not. 1. The simplest connection option for those with existing gear is to use Ergo's analogue inputs and outputs, and place it between your current audio interface analogue outputs or D/A converter and your monitor speakers. However, this adds another set of A/D and D/A converters to the signal chain, and according to my measurements adds a modest 3.4mS to overall playback latency. 2. If your existing interface has a spare S/PDIF output then it makes more sense to use Ergo's S/PDIF In and analogue outputs, thus bypassing the interface D/A and Ergo A/D converters. Sample rates of between 32kHz and 96kHz are supported, and this is the recommended approach for Pro Tools owners and I suspect most other DAW users. 3. The third option is to use the Ergo as your main audio interface, choosing its ASIO drivers within your chosen sequencer application. This is the most economic route, since you then don't need another audio interface, and also results in the cleanest signal path, since software audio will then be sent directly to Ergo via its Firewire port. However, Ergo's single pair of line‑level inputs won't appeal to those with more demanding recording requirements, who will have to switch to a multi‑channel audio interface during the recording phase, and then back to Ergo during mixdown. Some may find this approach frustrating. If only the Ergo had an S/PDIF output as well as input, so you could simply use its correction filters and your existing interface/converters! The holy grail of room correction is not only to reduce frequency‑response anomalies, but also to correct 'time-domain' issues. Confusingly, though, the latter term tends to mean different things to different people. Some room‑correction systems offer simple 'time alignment' (a different delay for each channel) to ensure that the sound from both loudspeakers arrives at the listener's ear simultaneously. These are particularly useful for PA and surround use, where lots of loudspeakers are involved. Others use 'time domain' when talking about correcting the phase response of each speaker, which improves the stereo imaging of phantom sources between the loudspeakers. This is the approach taken in KRK's Ergo when you use its Focus mode, and it generally makes the bass end sound tighter and more punchy — a statement borne out by my own listening tests. However (as KRK are happy to admit) these improvements will only be heard at the main listening position, while the sound elsewhere in the room will probably be worse in this mode. The same term could also refer to the transient response of the speakers themselves: how quickly they stop playing a note (or conversely how long notes 'overhang' after the signal stops). The two time‑domain issues that people would most like to improve in typical rooms are: the clutch of early reflections that arrive at the listeners ears at different times — after the direct sound from the loudspeakers bounces off the walls, floors, ceiling, and other objects in the room — resulting in a smeared stereo image; and the 'modal ringing' of some notes at frequencies related to the various room dimensions, making them both louder and flabbier than other notes in the scale. One technique that can improve such time‑domain effects as these, particularly below 500Hz, is 'minimum‑phase equalisation', which results in shorter reverb tails at low frequencies near the measurement position, and hence a significantly tighter bass end. This only works if the time delay of the filter is longer than the reverberation time of the room. For example, one commercial system using this approach imposes a one-second time delay — and this is fine for the hi‑fi world, or indeed any application where you're only listening and latency isn't an issue. Unfortunately, though, this approach is rather impractical in studios, because you require low latency particularly during recording, and often during playback while mixing too. There are some more sophisticated DSP systems, such as the Trinnov Optimizer, which manage to reduce the effects of early reflections, bass overhang of speakers, and even modal ringing — and these are already used in various studios and broadcast facilities. But even the stereo version costs several thousand dollars, which puts it in a rather different category! Can significantly improve acoustics in some scenarios. Room calibration process is easy and relatively foolproof. Good value for an audio interface/monitor controller with integral room correction features. Can be used as a stand-alone device without a computer, once calibrated to the room. Adds latency plus an extra set of converters to the signal chain, unless you use it as your main audio interface. Expensive if used solely for room correction. KRK's Ergo may offer significant improvements in playback quality depending on the individual room, and is good value when you realise it's also an audio interface and monitor controller, but it's not a substitute for traditional acoustic treatment. KRK +1 954 689 8833. 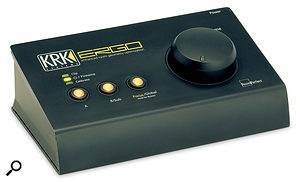 KRK Ergo system firmware 1.10, DSP firmware 1.0a, v1.02 drivers. Intel Conroe E6600 2.4GHz dual‑core processor, Intel DP965LT motherboard with Intel P965 chip set running 1066MHz system bus, 2Gb Corsair PC2‑6400 DDR2 RAM, and Windows XP with Service Pack 2.